Dave Hakstol was named coach of the Philadelphia Flyers on Monday. Flyers general manager Ron Hextall said he wasn't interested in hiring a big-name coach, he wanted the right coach. And he said in making the announcement that he believes he found him. "I wasn't going to choose the coach that was the people's choice, the popular choice," Hextall said. "I was going to pick the coach that I felt like for this franchise from today, next year and moving forward was the right coach. And Dave is the right coach for this franchise at this point." Hakstol spent the previous 11 seasons as coach of the University of North Dakota. He replaces Craig Berube, who had been fired April 17 after two seasons. There were a number of better-known options available, among them former San Jose Sharks coach Todd McLellan, former Pittsburgh Penguins coach Dan Bylsma and former New Jersey Devils coach Peter DeBoer. There also was the option of speaking with Detroit Red Wings coach Mike Babcock, who had received permission to talk with other teams earlier this month. But in the end Hextall picked a coach who had been one of the most successful at the NCAA level. In his tenure at North Dakota, Hakstol went 289-143-43, made the NCAA Tournament each season and reached the Frozen Four seven times, including this season when North Dakota lost to Boston University in the national semifinals. He's also coached 20 players that have gone on to the NHL, among them Chicago Blackhawks captain Jonathan Toews, St. Louis Blues forward T.J. Oshie, New Jersey Devils forward Travis Zajac, Winnipeg Jets forward Drew Stafford and Los Angeles Kings defenseman Matt Greene. However, Hakstol has no previous NHL experience as a player or a coach. And he's the third person to go directly from NCAA hockey to being an NHL coach without any prior NHL coaching experience; Bob Johnson was hired by the Calgary Flames from the University of Wisconsin in 1982, and Ned Harkness went from Cornell University to the Detroit Red Wings in 1970. Hextall knew Hakstol prior to starting his coaching search; Hextall's son Brett played for Hakstol at North Dakota for three seasons. Hextall said that gave him an appreciation for the way Hakstol's teams played. "In watching my son over the years I grew an appreciation for Dave, for the way he coached," Hextall said. "I followed his career. I've thought about him long before this as a head coach in the National Hockey League. I believe he was destined for it." Hextall said he still had to get to know Hakstol better, and spent parts of four days in person and on the phone with Hakstol before deciding he was the right coach. "I had a list of things I wanted from a head coach and went down this checklist in my mind and every box was checked except for the NHL experience," Hextall said. "Quite frankly, for me that's the one that's least important. It's no different from a rookie player. Does Dave have things to learn? Absolutely; he'll be the first to admit it. He's got a lot of time here to get to know the League, get to know our team, familiarize himself with the area, look into forming a staff. "It's a big jump; that's fair to say. … I had a lot of questions for Dave in terms of the schedule, 82 games vs. low 40s; there's an adjustment there. We talked about a lot of things. I was very comfortable with his answers. He's very direct, he knows what he believes in. In the end it comes down to a gut feel. Can Dave handle NHL players, the schedule, the differences in the collegiate level vs. this level? Every time I asked myself that question my answer was yes." Hakstol said he understands moving from college to the NHL will have a learning curve, but he believes his philosophies and how he wants the Flyers to play will allow him to adapt well. "You have to be a good team without the puck," he said. "You've got to work and play fast without the puck and with good structure. It's about transition. But you've got to have the puck in order to be able to transition up the ice. You're going to see with me an expectation that our defensemen are involved in an awful lot of our play in terms of our play with the puck. I think it's essential as far as getting up the ice and in the zone. "I don't have experience at this level so I'm not going to pretend that I do. But I do have a great deal of confidence in what we do, in what my philosophies are and that they're going to be successful here. … It's going to take an awful lot of communication. I have to get to know our players and I want them to get to know me. I want to have some clear expectations of the way we're going to play the game. We want players that are buying into the philosophy of winning and what that takes. When you break that down it comes down to doing all the little things day after day, taking care of the details, being disciplined enough to do them day in and day out and understanding why you're doing them is going to be very important. That's something that I'm confident I can convey to our group." The group he inherits has missed the Stanley Cup Playoffs twice in the past three seasons and hasn't won a playoff series since beating the Pittsburgh Penguins in the first round of the 2012 playoffs. This season the Flyers finished 14 points behind the Penguins for the final wild card from the Eastern Conference. There is a solid core group in place with forwards Claude Giroux, Jakub Voracek and Wayne Simmonds, and goaltender Steve Mason finished in the top eight in the NHL in goals-against average and save percentage. There also are a few prospects who could be in the NHL next season, chief among them forward Scott Laughton and defensemen Samuel Morin and Shayne Gostisbehere. The Flyers also have two picks in the first round of the 2015 NHL Draft, No. 7 and the Tampa Bay Lightning's selection. 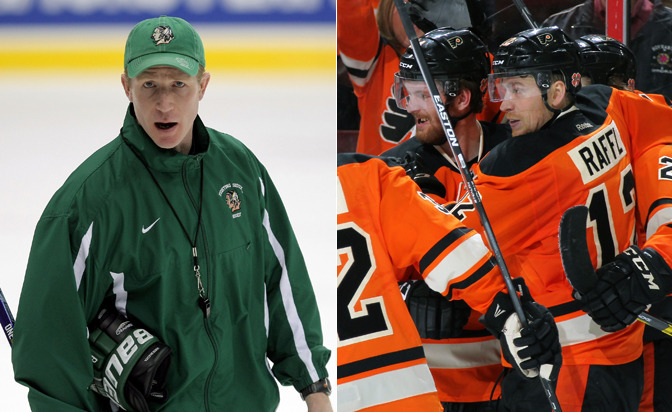 "I think the most important thing there to recognize is I love the position I was in at North Dakota," Hakstol said. "To consider leaving my role there … the opportunity that Ron and the rest of the Flyers organization have presented here is that right opportunity. A lot of it comes down to the time that I spent with Ron and other members of the staff here. A big part of is the history and tradition and how much meaning that has in this city. It's an excitement about the group of players and some of the guys coming that plays a large role in it." Hextall refused to discuss any other candidates he had spoken with about the Flyers' job. He said Hakstol was the first candidate he spoke with, and early on in the process he had a good feeling about him. "I feel very comfortable with where we're at," Hextall said. "I had to get to know him intimately and as we went through the process it just came to me that this is our guy."